Visibo Product Updates: New Addon!! Incredible Bookmarks 0.5 is released! New Addon!! Incredible Bookmarks 0.5 is released! Incredible Bookmarks is the ultimate addon suite for bookmark lovers. 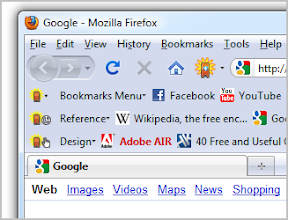 Features include dynamic bookmarks toolbar and other bookmark utilities. Download from here now! -Show all bookmarks in Bookmarks Menu with highlights! 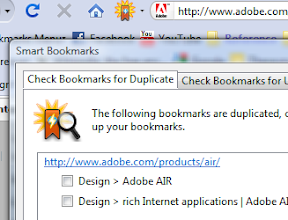 I downloaded Incredible Bookmarks, and had it check for duplicates and to check links. It found plenty, and I checked all the checkboxes (a "select all" button would be nice...) and click on "remove selected bookmarks" and nothing happens. Hi, thanks for the suggestion. A 'Select All' button will be added in the next version. A notification message should be shown after you clicked 'Remove selected Bookmarks'. Please refer to this video for more details. There was no notification message--I click on "remove selected bookmarks" and nothing happens. I'm running IB 0.5 under Firefox 3.5.5 on Windows XP Pro. Under IE, I use a lot of folders in the Links bar that pertain to various things I care about (i.e. Search, Testing, MS Access, etc.) Some of these folders have subfolders. I've imported all of my IE Favorites into Firefox, and now I have a particular folder and a subfolder that I want to convert to IB toolbars. However, when I try to add a new IB Toolbar by clicking the appropriate button, it adds a duplicate copy of the Bookmarks Menu IB toolbar. Well and good, except if I try to clear out the duplicate toolbar so I can add the stuff I want, it deletes it from the Firefox Bookmark menu, which I don't want. Is there a way to add just a blank IB toolbar? @tbgg: You can easily specify which folder to show in each IB toolbar, it is like a container/view of the original bookmark folder. On each IB toolbar, there is a 'Folder button', click to open a dialog and choose the folder to show. For example, you can choose the folder 'work' for the 1st toolbar & folder 'play' for the 2nd toolbar. If you don't choose the folder, by default it would show the 'Bookmarks Menu'.